(Nanowerk News) Organic photovoltaics have achieved remarkably high efficiencies, but finding optimum combinations of materials for high-performance organic solar cells, which are also economically competitive, still presents a challenge. Researchers from the United States and China have now developed an innovative interlayer material to improve device stability and electrode performance. 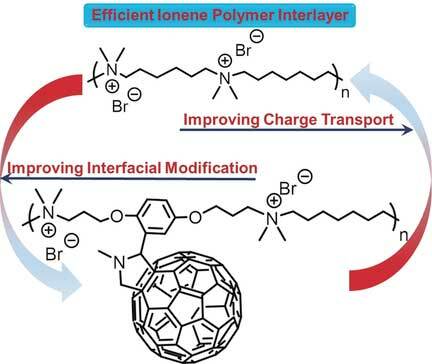 In the journal Angewandte Chemie ("Transforming Ionene Polymers into Efficient Cathode Interlayers with Pendent Fullerenes"), the authors describe their fullerene-spiked, readily processable ionene polymer, which boosts the power conversion efficiency of organic solar cells. In contrast to common silicon-based solar cells, organic photovoltaics (OPVs) involve organic molecules in solar power generation. Materials in OPVs are abundant and processable, cheap and lightweight, and the modules can be made flexible and with tunable properties. The major disadvantage of such materials is that achieving longevity and high performance requires elaborate settings and architectures. Optimized combinations of materials that match the electrodes remain elusive. Silver or gold metals form air-stable, processable cathodes, but they also lower the device potential. To overcome this problem, Yao Lui at Beijing University of Chemical Technology (China), and Thomas Russell and Todd Emrick at the University of Massachusetts, Amherst (USA), and their research groups, have developed a novel polymeric material to serve as an interlayer between the electrode and the active layer. This interlayer must be conductive and must lower the work function of the cathode by providing an interfacial dipole. As an interlayer material, the researchers investigated a novel class of charged polymers, the ionene polymers. “Ionene polymers are polycations in which the charged moieties are positioned within the polymer backbone rather than as pendant groups,” the authors explain. This leads to a higher charge distribution than in conventional cationic polymers, and in addition, better tunability. Ionene polymers provide a useful interfacial dipole, but alone, they lack the required conductivity. Therefore, the authors included fullerenes in the structural framework of the polymer layer. So-called “bucky balls”—fullerene spheres made solely from carbon—are already used as common acceptor molecules in OPV devices. They are highly conductive and have many other favorable properties. The scientists prepared the fullerene–ionene interlayer material by innovating on conventional step-growth polymerization chemistry with novel, functional monomers. They assembled the OPV devices and included an interlayer. The result was an impressive boost in power conversion efficiency—on average three-fold—when compared to devices without the interlayer. Efficiencies of over 10% point to further applicability of these modular devices. This work shows that a relatively simple modification to the composition of materials can improve the efficiency in organic electronics and can overcome intrinsic problems related to the combination of hard (electrodes) and soft (active-layered) materials.